Victory Lane Performance Products Engine Treatment with PTFE has a friction reducing technology designed to extend the life of your engine, reduce cost and improve performance. Victory Lane Performance Products Engine Treatment with PTFE has a friction reducing technology designed to extend the life of your engine, reduce cost and improve performance.Our Engine Treatment is compatible with all oils, conventional as well as synthetic, and can be used in gasoline and diesel engines. After application, the lubrication system of the engine will carry VL Performance Products Engine Treatment to the lubricated friction surfaces, filling in microscopic pores – more than 100 times smaller than a human hair. Once heated, while either driving or with the engine running, this will create a long lasting bond between these metal surfaces and our Engine Treatment. These bonding agents of PTFE protection will help reduce wear by 50% to 90%. 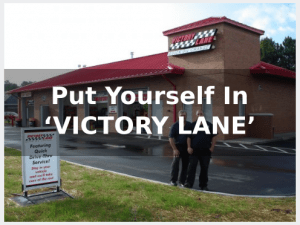 Victory Lane Performance Products PTFE Engine Treatment will help your vehicle last longer and operate more efficiently with less maintenance cost. For Best Results it is recommended to use VL Performance Products Engine Treatment once a year.